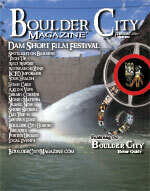 As I was growing up in Boulder City, during the summer the City Pool was the center of my universe. Maybe some of you remember the rules of the “old” pool. Before a youngster was allowed to swim in the deep end, they had to be able to swim across the pool and back. Well, at the age of 3½, I did just that. The amazing thing is none of it was done above water. Of course I came up for air, but I was a real pollywog. Later, my mother coached swimming and I was on the swim and dive team and did water ballet. Over the years, the City built a new pool and expanded on programs. When Aquatic Coordinator Steve Corey left, Stana Hurlburt took the reigns and did a marvelous job. This past summer, Stana Hurlburt moved and there was no one in place to step into the position who had the type of experience and training the City was looking for. When the City advertised for the Aquatics Coordinator position, Angela Curtola applied and started working in June of 2006. Let me introduce you to Boulder City Parks and Recreation Department Aquatics Coordinator Angela Curtola. Angela comes to us with a degree in Recreation and Leisure Studies and working towards her master degree. Starting her career as a Jr. Lifeguard in Vallejo California, Angela worked her way up the ladder and became the first full-time Aquatic Coordinator for Hercules, California. In 2005, Angela took a position with the US Navy and worked in Hawaii and Japan. After meeting and falling in love with a sailor while in Japan, to our benefit, he convinced her to marry him and relocate to Henderson. Currently holding the position of Vice President for the National Recreation and Parks Society  Aquatic Branch, Angela is highly motivated and brings to Boulder City an unwavering passion for teaching children and adults how to swim. Visit the Boulder City Pool Complex located at 861 Ave. B. Feel free to connect with Aquatics Coordinator Angela Curtola to share your vision for the Boulder City Pool. For more information about Boulder City Parks and Recreation offerings, visit our office at 900 Arizona Street or call us at 293-9256.